The Helvetia & Bristol is a lovely, traditional hotel which offers everything a lovely, traditional hotel should: comfortable luxury, a wonderful location and excellent food – indeed, the kitchens are now run by a young chef of very considerable talent. 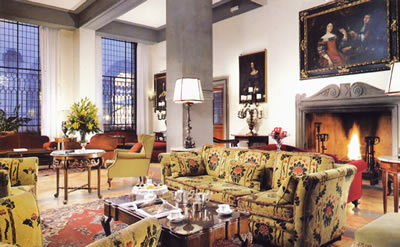 Of course, there are numerous very good hotels in and around Florence. But the Helvetia & Bristol is the only deluxe establishment which manages to be both in the very heart of the city and yet removed from its hustle and bustle. Doubtless, this is why Igor Stravinsky, Giorgio de Chirico, Pirandello and Bertrand Russell liked it so much. (Composers, painters, playwrights and philosophers deserve the best hotels, after all.) 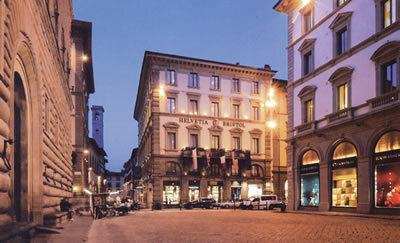 Right across the street is the magnificent Palazzo Strozzi and only a few steps away is the Piazza della Repubblica. The hotel is a Renaissance-style building, erected in 1894, and it looks entirely at home among its distinguished neighbours. The atmosphere within is calm and civilised. Indeed, as soon as you pass through its doors, you are surrounded by fine silks, good oil paintings, antique furniture and crystal chandeliers – the things which soothe. Then there is the staff. Courtesy and efficiency are what I want from those who look after me – with, if possible, a little dash of friendliness. All three were evident in those I encountered here – whether it was waiter Marco at dinner or the lady and her gentlemen companions (whose names, sadly, I did not record) at the Reception desk. From the moment I arrived until the moment I departed, the members of his team were a credit to the General Manager, Stefano Venturi. Of its 45 rooms, I stayed in number 272, on the second floor. This apartment suited me very well. 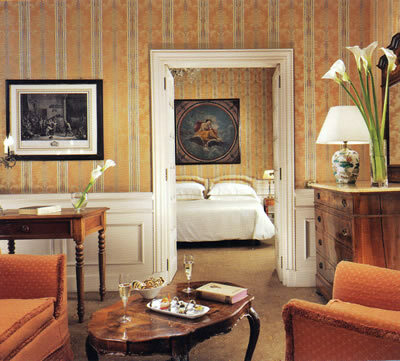 Classed as a ‘Deluxe Double’, its price runs from 338€ to 515€ a night, bed and breakfast for two, according to season. (You should check the price for a specific date on the hotel’s website). From the corridor I entered straight into a bed-sitting room of good size and rich, warm decor. Red was the dominant colour (used for the curtains, the carpet and the figured silk damask on the walls), set off by the gilt frames of the paintings of pastoral scenes, the blue of the chaise longue and the green of the two armchairs. Lighting was provided by table lamps, wall lights and a six-branch chandelier. The two windows looked out onto the street at the front of the hotel. There was plenty of space for a writing desk with an elegant lamp in the candlestick style. The bathroom was clad in black and grey marble and its Penhaligon toiletries ensured that my ablutions – during which, as usual, I carefully avoided using the pair of scales – were occasions of pleasant pampering. It had one wash basin, a bath of decent size with a shower over, a loo, a bidet and lots of fluffy white towels. I think breakfast would normally have been had in the Winter Garden, a room with potted palms which has an impressive ceiling of coloured glass. But the presence of a large party of keen art-lovers – whose enthusiasm prompted an early start each day – meant that, instead, I broke my fast in a room off the main restaurant. This was no penance, for the chamber was elegant and my round table was large. From the buffet I secured comestibles of high quality, including chunks of fresh pineapple and melon, plates of bacon, tomatoes and mushrooms, crusty rolls with blackcurrant jam, croissants and slices of the most delicious chocolate tart. To me were brought glasses of freshly squeezed orange juice, silver pots of coffee and, of course, my customary concluding cappuccino. The restaurant for dinner is called the Hostaria Bibendum. It is off the main entrance hall and has its own entrance from the street. Its two rooms are small and intimate and decorated in red, silver and gold, with exotic gilt chandeliers and framed silhouettes in the 18th Century manner. I sat on a chair upholstered in scarlet velvet at one of the corner tables and appreciated the warmth of these surroundings. 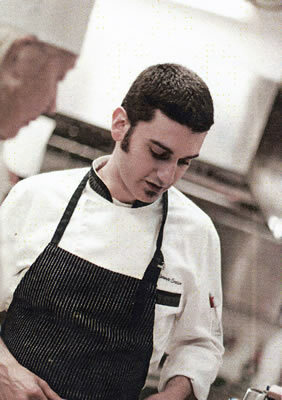 Chef Roberto Cordisco (pictured) is a handsome young man of considerable culinary talent. His cuisine is straightforward, the ingredients he uses are top rate and the skill with which he handles them is impressive. 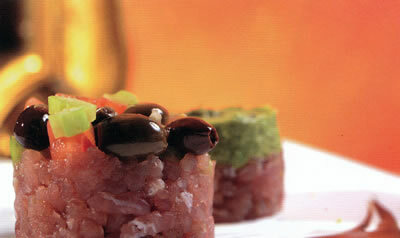 The dishes which come from the kitchen are therefore pleasing to the eye and exciting to the palate. He offers a 4-course set seafood menu for 42€, but I went for four courses from the carte (for which you should allow around 65€). I began with carpaccio of salmon, marinated in dill and Szechuan pepper with an orange flavoured salad. This was a lovely, thick cut of fish, expertly prepared. It went tremendously well with the orange, although the green part of the salad might have been better omitted. Then came spaghetti with porcini mushrooms – again, precisely and properly done and a credit to the kitchen. Best of all was the main course, because the sirloin of beef – sliced, and served with green beans and shallots – was of excellent quality, and matched its ravishing taste with its pleasing tenderness. With this I had some excellent, chunky chips. I thought the pudding sounded a bit dreary – citrus parfait with chocolate sauce – but, when it came, it was exquisitely good and rounded off a thoroughly enjoyable dinner. 77 wines are offered, all Italian except the champagnes. Prices are friendly and range from 25€ for a 2011 Tuscan white (Poggio ai Ginepri Bolgheri) to 220€ for 2004 Cristal champagne. The 2004 Barbaresco from Mr Gaja is 198€. These lovely reds from Tuscany caught my eye: 2007 Luce (85€), 2008 Tignanello (85€), 2003 Solaia (180€), 2006 Ornellaia (165€) and 2007 Sassicaia (180€). I drank another super-Tuscan, from the 2010 vintage, made from cabernet sauvignon, merlot and cabernet franc. It was still quite severe, but was beginning to show lots of well-structured black fruit (Argentiera Bolgheri Superiore – 45€). You will drink well here. 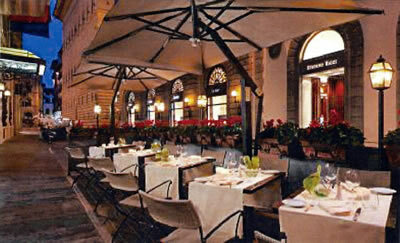 The Helvetia & Bristol is a lovely, traditional hotel in the best location in central Florence, with excellent food, good service and discreet comfort. I recommend it to you. Via dei Pescioni 2, Florence 50123, Italy.